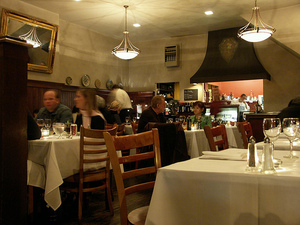 Gadaldi is sad to think of ending his 15-year run at the restaurant, since he was one of the few to focus on regional Italian cuisine at that time in San Francisco, and it helped establish him in the local dining scene. He said it was becoming difficult to dedicate the time he wants to at his other establishments (hotspots Beretta and Delarosa, and Pesce, also on Polk) since Antica was set up to really demand his full attention. As far as what the Rainers have in store, Gadaldi tells me they want to focus on Alpine cuisine, with a variety of beers. Inside Scoop mentions the working name is “Leopold’s” (subject to change), and a communal table and casual atmosphere are what’s to come. 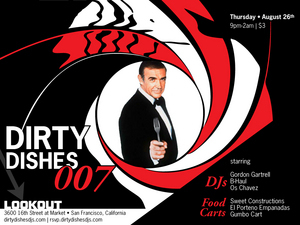 2400 Polk St. at Union, 415-928-5797. Since I get asked this question monthly, I was happy to see this latest reveal from Grub Street about Charles Phan’s plans for his former (and original) Slanted Door location at 584 Valencia (where the Levi’s Workshop is closing up this weekend). According to the article, Phan said, “It’s going to be big. Asian, with a bar, but it might be next year by the time all the permits and everything come through.” Things will be TBD for a while, including the name, so sit tight for more info soon. 584 Valencia St. at 17th St.
Déjà Vu: Have We Not Met Before? 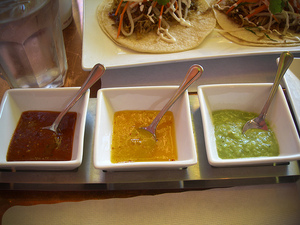 Salsa trio B. Flickr photo by markevnic72. Welcome to Déjà Vu: The Salsa Edition. Déjà Vu is a new feature on tablehopper where I will occasionally be highlighting two similar dishes (like, too similar), and you have the chance to call out where you’ve seen them. And, most importantly, vote on which one you think (or know) came first. I will post a recap of all your answers in the next issue of tablehopper. Sure, they say imitation is the sincerest form of flattery (“If you like Giorgio, then you’ll love Primo!”), but it can also chap your hide. (This inaugural edition was inspired by a cranky tweet I saw, calling the dish out.) Feel free to send in sightings, images, suggestions, and gripes (chefs, I am talking to you—all Déjà Vu sightings will remain anonymous, so feel free to call out any copycats that are jocking your style). On Saturday, as I was circling (and circling) for parking at the Street Food Festival, I noticed a sign announcing ~CHILLI CHA CHA~ is going to be replacing China Fun Fast Food. 3166 24th St. at Shotwell. A couple weeks back, I mentioned ~BAI THONG~ was coming to Hayes Valley, moving into the former Thepin Thai Cuisine spot. The owners, who used to have a restaurant in northeast Thailand and have been working in SF for the past seven years, are opening this Saturday August 28th. They refreshed the interior, and it sounds like the wine list is also going to be getting some love. Hours will be Mon-Thu 11am-11pm, Fri-Sat 10am-12am, and Sun 10am-10pm. 298 Gough St. at Fell, 415-863-9335. The ~DIRTY DISHES~ crew is at it again, doing one last load before heading out to the playa. This Thursday will feature The Gumbo Cart, and newcomers to the party, El Porteño Empanadas and Sweet Constructions, along with a trio of DJs (B-Haul, Gordon Gartrell, and special guest DJ Os Chavez aka Melvin). 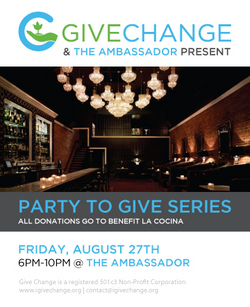 On Friday August 27th, GiveChange will be hosting its monthly ~PARTY TO GIVE~ happy hour and benefit at The Ambassador. This month’s event will raise money for Bay Area charity La Cocina, which has launched a new initiative to help low-income San Francisco residents create sustainable mobile food businesses. Swing by The Ambassador between 6pm-10pm on Friday for an extended happy hour, drink specials, free snacks, and exclusive raffle gifts. There’s no cover! As a special treat, La Cocina food entrepreneurs will be showcasing their tasty products. (The last Party To Give raised over $500 and featured gifts from Coffee Bar, Bissap Baobab, homefrys, and more.) 100% of proceeds from the raffle and the bar will be donated to La Cocina. So think about it: the more you drink, the more you give! Spread the word, and RSVP via Facebook. Cheers! I knew the right way I needed to do the ~SF STREET FOOD FESTIVAL~: ride my bike down there early, and go with at least a couple hungry friends. But I ended up having to do the exact opposite: I had to drive my car because I was running car-necessary errands that day, I showed up late in the day, and was flying solo. Plus, I could only find a parking meter space, so I had a little over an hour to power through. But trust, I made some serious headway. There were a lot of people, a lot of lines, a lot of delicious food (some places had sold out, but there was still quite a bit to try), and a lot of dazed-looking but happy chefs and kitchen crews. Negatives: there was sadly a ton of garbage, challenging event flow against the lines of people, and what was up with people bringing dogs to this event? 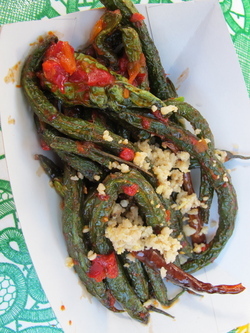 I also thought some vendors were missing the point of street food (uh, food I can eat with my hands please!). Anyway, kudos to La Cocina for pulling off such a big and delicious and unique event. Here’s a mini photo album of my “hour of power.” All I can say is Delfina’s beans blew my mind, and Aziza should open a fried chicken place. Delfina should also open a meatball sub shop. oil. There’s also a unique Italian sandwich that has been added to the menu, a panuozzo, which is a traditional Neapolitan sandwich made with par-baked pizza dough that’s filled with meats, cheese, and vegetables, then baked again. Yesterday’s featured fillings included mortadella, prosciutto cotto, sopressata, provolone, arugula, and roasted cherry tomatoes. Lunch is served Mon-Fri 11:30am-2:30pm. Also worth noting: reservations are now accepted (you don’t have to be a party of five), and since the bar is open all day, you can swing by anytime for the delicious cocktails, wine on tap, and beer. Starting this Saturday August 28th, ~CAFÉ DES AMIS~ is starting brunch service, with items like a croque-madame, duck confit hash, and buckwheat crêpes with brûléed bananas. Brunch is served Sat-Sun 10am-3pm. 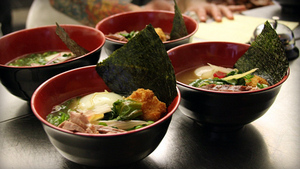 So while it looks like the Ryan Ostler BBQ Monday nights I mentioned at ~BAR TARTINE~ are delayed, starting September 6th (yes, Labor Day), Hapa Ramen is going to be doing their ramen on Monday nights for the month of September! More details soon—and one more opp for noodle slurping will be Tuesday September 7th, Hapa Ramen’s first day at the Tuesday Ferry Plaza Farmers Market. 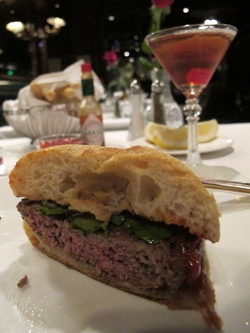 How I roll at the Big 4: Moroccan lamb spice burger and a Manhattan. ~BIG 4~ is getting in on the retro vibe, and starting September 1st is going to be offering a “Mad Men” dinner series every Wednesday evening. The $36 three-course prix-fixe menu (cigarette not included) will feature throwback menu items the Sterling Cooper Draper Pryce team would enjoy tucking into. 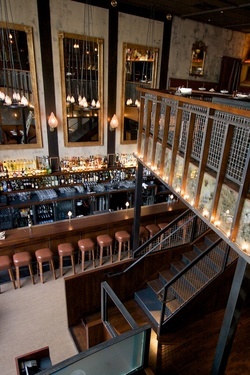 There will be four separate menus rotating each Wednesday, with specials like vodka-soaked shrimp cocktail, chicken Kiev, clams casino, surf and turf, and bread and butter pudding with whiskey sauce. Classic cocktails will be highlighted on the menu (which is all I ever order there), like Manhattans, old fashioneds, gimlets, etc. The specials will run through October 27th. The duo behind Lalime’s, Sea Salt, T-Rex Barbecue, Fonda, and Jimmy Beans, Haig Krikorian and Cindy Lalime, have just opened ~PAISAN~, a pizzeria on San Pablo Avenue in Berkeley. Look for thin-crust pizzas from the Earthstone wood-fired oven with California toppings (like pesto, rocket salad, Sausalito springs watercress, and Grana Padano, $15.50). The menu is rounded out with rustic Cal-Ital items like eggplant caponata, romano beans, and arancini, and larger dishes, like porchetta, half a roasted chicken (only $11.75), and roast pork belly and pork loin with balsamic onions and plum mostarda. The large 18-seat bar will feature variety of both classic and original cocktails, 10 beers on tap, and a wine list put together by Stephen Singer. 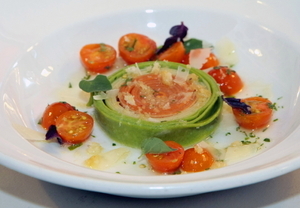 According to an SFoodie post, the pizzaiolo is Francesco Pece, from Naples. Additional details: there’s a rear patio and full bar. 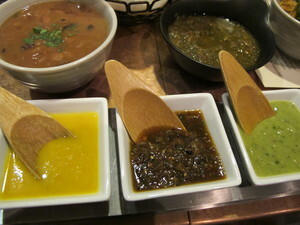 Dinner will be served Wed-Sun. 2514 San Pablo Ave. at Dwight, Berkeley; no phone yet. Slated to open its doors in downtown San Mateo this Wednesday, ~OSTERIA COPPA~ will offer housemade salumi (like lomo, mortadella, and duck prosciutto), antipasti, and handcrafted artisanal pasta and pizza from chef Chanan Kamen (Quince, Jardinière). The pastas are sure to feature a deft touch due to Kamen’s time making pasta at Quince; one of my favorites, agnolotti dal plin (filled with veal, pork, and guinea hen) is on the menu. There’s also a spacious bar (40 seats), featuring Italian cocktails and a mostly Italian wine list with wines available by the quartino. The 40-seat patio will allow diners to take advantage of San Mateo’s great weather, and the 100-seat main dining room features hewn wood floors, white butcher paper-topped tables, and butter yellow walls. 139 South B St. at 2nd Ave., San Mateo, 650-579-6021.